During the Industrial Revolution of the late eighteenth century, Staffordshire became a centre for the pottery industry, coal and ironstone mining. 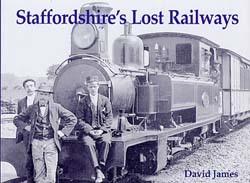 Railway links became essential and soon a network of passenger and goods lines sprang up. As in most counties in England, they enjoyed a boom century of popular use before the end of steam and the Beeching cuts of the 1960s dismantled most of them. This book provides us with the story of these lost lines. Some locations featured in the 49 nostalgic photographs are Hulme End, Norbury, Cheddleton, Wetton Mill, Horninglow, Stretton & Clay Mills, Tutbury, Pelsall, Brownhills, Alrewas, North Rode, Bosley, Leek, Kingsley & Froghall, Oakamoor, Alton, Rocester, Norbury & Ellaston, Ashbourne, Fenton Manor, Black Bull, Milton, Stockton Brook, Wall Grange, Stafford Common, Salt & Sandon, Grindley, Silverdale, Madeley Road, Pipe Gate, Market Drayton, Cobridge, Cheadle, Tean, Totmonslow, Beeston Tor, Thor�s Cave, Butterton, Ecton, Bradnop, Waterhouses, Trentham, Colwich, Sandon and Normacot.